The Cycle Preview - Should I Shoot or Should I Go? The Cycle Preview – Should I Shoot or Should I Go? Public service announcement: The Cycle is not a Battle Royale game. Thank heavens for that. It is aptly described by developer Yager as a ‘competitive quester’. To put things simple, this is a shooter where players are tasked with completing certain missions and evacuating the planet before their rivals. But there is a lot more to that. We had a blast playing this game and soon realized that behind its looks of run-of-the-mill PvP shooter lies a strong, willing heart. This is a shooter with a remarkable sense of freedom, one where you can explore the dangerous planet Fortuna III as you wish, tackling objectives in any order that you feel like. There are no restrictions apart from the time limit – you can drill minerals, collect mushrooms, hunt rare beasts and many other things, all of this without firing a single bullet against your human opponents. You can even make a pact with someone if you’re not too trigger happy. Some of these contracts will immediately attract the attention of the aggressive fauna, and it’s not uncommon to see other players wrestling with you for the same goal. This is in short, a PvPvE game, where the player versus player part remains entirely optional – at least until you reach the evac ship, where ambushes are commonplace. As you may recall, Yager is the maker of acclaimed story-driven shooter Spec Ops: The Line and the underrated Dreadnought. The change of direction is noticeable, but instead of settling for another Battle Royale, they created a game where every match is genuinely different. 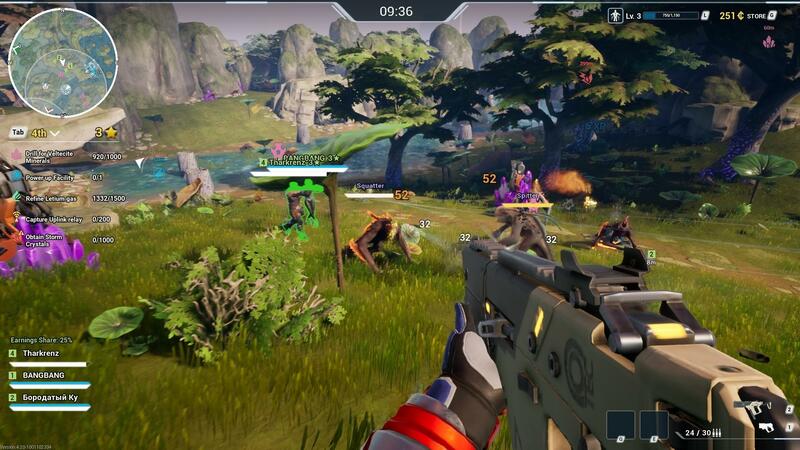 It may even bring a tear to some of you who fondly remember Firefall, especially the thumper. The Cycle currently offers solo and four-player squad modes, with up to 20 players per match. The goal is always the same – complete as many contracts before the timer runs out and the evac ship leaves the planet. You can choose from five different classes: Champion, Poacher, Prospector, Bruiser and Tracker. You can also affiliate yourself with one of three factions: Korolev, Osiris and ICA. Each faction is inclined to certain ideals, which ultimately translate into different types of upgrades that you may get. Shooting the not-so-lovely fauna will get you credits that you can spend in the gear store. But where is this store in such a dangerous and unhabited planet, you ask? Well, it isn’t. Your purchase will drop from the skies right to your feet but pick it up quickly as other ruthless Prospector may get to it first. There is a nice feel to the weapons and movement – you can equip a jetpack, among other abilities, gadgets and weapon mods that add a welcome layer of depth to combat. The Cycle also includes a pinging system so that you can easily pinpoint enemies or locations of interest for your squadmates to move on. Visually speaking, The Cycle is the rare kind of game that looks better when you play it than it does in any screenshot or trailer. 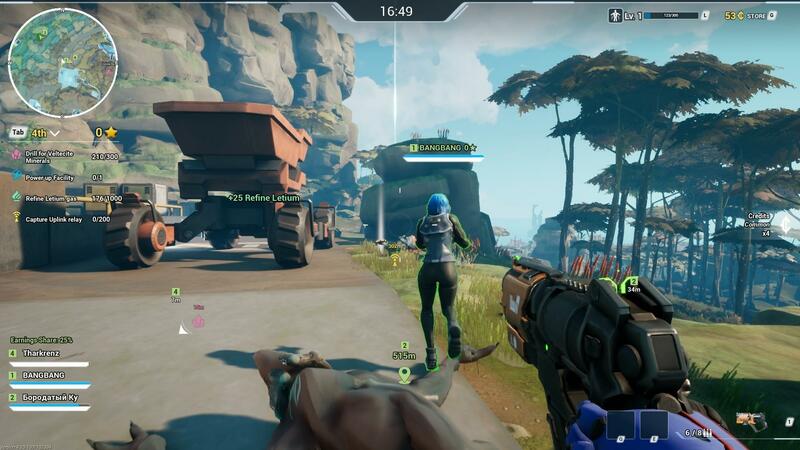 It has a slight cartoon feel to it but not quite, the muted color palette provides a laidback environment but also gives place to some truly stunning vistas, and once again Firefall often comes to mind. I like the overall style, some places of the planet more than others, and Yager is continuously improving the game’s graphics – the beach is one good example. When it was revealed that The Cycle will be free-to-play, I felt relief. This is a game that you must try, because it is more than the sum of its parts. It’s a shooter but you spend more time questing that firing bullets, it’s PvP but only a slight, insignificant fraction – unless you want to go full guns blazing – and it has the potential to offer something new every time, but the one thing that it always brings is a hefty dose of fun.